The rights of design of the cards including their parts solely lie with the company; however, if a customer wants to change the design, it can be done considering the factors like feasibility, availability of the desired material and possibility. 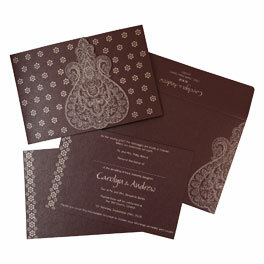 As to maintain originality, there will be a press line www.123weddingcards.com at the back of the envelope. In case the customer does not want the press line, he can ask for its removal as well, while making the order or in process of proofing. The Local taxes, VAT and other duties will be paid by you. As we can not calculate, how much the local authorities are charging and what are the custom laws in different countries? Apart from these taxes, if there are some other additional taxes in your country or region, that will be completely paid by you. The cards in sample order are generally available in bulk as well, but there will be no guarantee in future for its availability. As the availability of cards depends on the running orders, there will be no surety /guarantee in future as well. However, we keep the cards in enough quantity. We ensure to the customers about the design and the shade of the cards, however, there might be a possibility that in future there could be a slight change in the color, texture and thickness of the cards. There is a possibility of change in color, texture and thickness of the samples and the main bulk order made in a later date. Handmade papers are recycled papers and are made from manual processes, thus the Cards or Card parts made in Handmade papers, have the chances or possibilities in shade difference or difference in thickness which may vary from card to card and Two cards can not be identical.The cards made in Handmade paper, thus, should be treated as unique product. There might be a possibility of difference in shade between the actual color of card and the image shown on the website. As these images are in JPEG format, the color depends on the resolution of the computer monitors. So kindly ask about the exact colors before placing the order or during the proof procedure. We are responsible for any printing mistake, if made in the final cards, after your approval of proofs. We produce exactly the same format which is on the last version of proofs finalized by you. Proof approval is the sole responsibility of the customer. However, there might be a difference in the shade/ color of the ink, as the printing is a manual process. We try to give the exact color shade but the as the mixing of colors is manual, so there could be a possibility of very slight color difference, as compared to the images on the computer. The sample cards order / orders are non-refundable but adjustable. The cost up to 5 samples and one time shipping charges are completely adjustable with the bulk order made later, where the cost of the cards and printing, excluding shipping, should be at least US $150 or more. If you do not make the bulk order later, the sample order bill will not be refunded. Even if you make two or more orders, the sample cost of 5 samples will be adjusted along with the shipping charges for one order only. If you are in hurry for the wedding cards order, kindly inform us through e-mail well in advance so that we can keep your cards reserved. 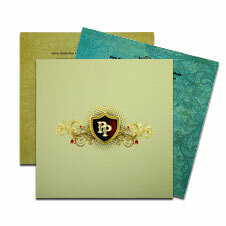 The bulk order supply is subjected to availability of the cards in stock. In case, you do not like our products and want to change or want any refund in lieu of that, the printed cards will not be changed in any case, however you can send the blank cards back to us, but you have to bear the shipping charges (To & Fro). (For more details about refund, kindly refer to refund policy section). We use world’s number one shipment services UPS / DHL / FedEx as our carrier, and we ensure that the cards reach to you in perfect state without any damage and in timely manner; however, we are not responsible for the situations beyond our control. Any changes made in the cards regarding paper material, design or size, as instructed by the customer, and are deviated from the original design as shown on the website, will be considered as a customization, and will be chargeable. Any change in the price of the cards and shipping will be informed by us while working on proofs. The price change will depend on the type of customization you are looking for. As standard, all the envelopes come without any self adhesive. We recommend using of good quality double sided tape for sealing them. However, If you want us to create them as self-adhesive, We can provide that as well. The cost of self adhesive will be charged separately, based on number of envelopes. Charu Overseas is holding company for the website. So please note the charges appearing on your credit / debit card statement will be as “CHARU OVERSEAS” instead of website name. By signup at the website you subscribed our blog for wedding inspirations & ideas, you can unsubscribe it at any time.